When I started this blog, I thought I knew my style. and a bit of shabby chic added in to the mix. Throw in some antiques and some junk and I was happy. and I've noticed lately that my style is changing. but I've been drawn to other things in the last few months. Take a look. Do you see what I mean? Did you see it? Yep, vintage industrial. but I kept it mostly in the garage and didn't use it. looking for more when I'm shopping. with all of my wonderful vintage industrial finds. Thank goodness it all works together. So, my style and my blog are evolving. my family has a lucky number, "3". You've also figured out that I love the color red. but good ol' country red, USA red, farmhouse red, a true red. to better fit me and the style of my blog. So, I think I'm going with "Red No. 3". Let's see how I like that for awhile. 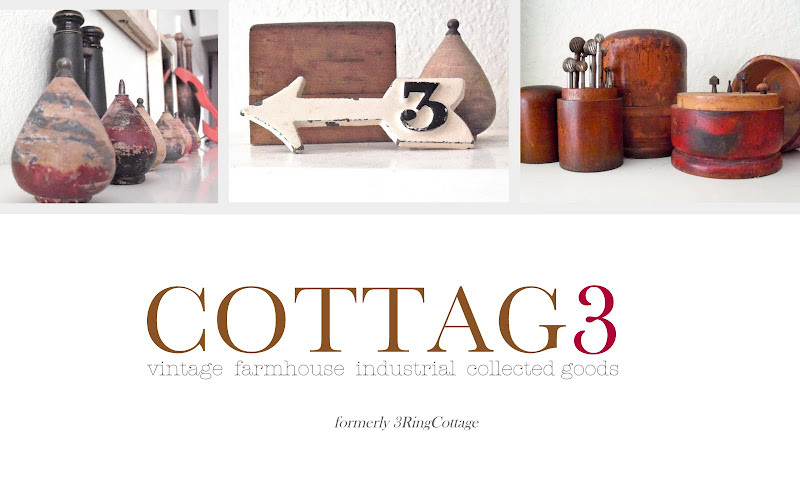 I'm not changing my address, it will still be under "3 ring cottage"
but my blog title, header and whatever else will change. I hope you all will know that it's still me when you see it. Up until now my blog has been mostly about decorating and my finds. I have thrown a little bit of "real life" in there along with the rare recipe. I think I may begin throwing some more "real life" into my blog. With my son starting high school, I may need the support, who knows. I know I enjoy glimpses into the lives of the blogs I follow. It makes me feel like I'm getting to know you better. So, it's only fair that I let you get to know me a bit better. Did you realize you've never seen a picture of me or my family? expect from blogging and I wanted privacy maintained at all costs. I think I'll let my guard down just a little bit...baby steps. So, please have patience with me and my blog as we grow and change. and make all of these changes that I had been thinking about for awhile. Good for you for allowing your blog to grow with you! I am drooling here over the lovely items in your photos and the new header. Wow! I also know what you mean about the privacy stuff. I was pretty firm about not showing my 'real life' in the beginning but as I got to 'know' more bloggers I felt a bit more comfortable. More authentic sharing a bit of who we are. I'm still careful about details, and I hope I don't bore people who are stopping by for decor etc. Looking forward to continuing to follow along. I like your new header! And you know I love your vintage industrial style, girlfriend! I love your new blog header AND title! And I think the photo of your red metal bed first attracted me to your blog. Change is good. I too like your new header and the new name, I have 5's and 7's around our house for 5 kids and 7 as a family. I like mixing the industrial with the farm and shabby too, I think it only fair to the 'menfolk' in the house to have a place where they feel comfortable too. I had a spell of it being more on the feminine side and even I felt out of place! I have always loved wheels and farm goods but thought they didn't fit in when we moved into this old victorian but it's us so I make it work. Well, at least I try to make it work! I resisted talking about family and putting pics up in the very beginning but honestly my life revolves around them so much it was impossible not to talk about them! Can't wait to see more, and I wish I had an answer to slowing down the process once highschool starts, but since mine started moving out I have been on the hunt for a time machine. If I find one I'll let you know. I so like the new name. Life is an evolution so go with it. Yes family and pictures would be nice. Liked your old header, love the new too!. I also love the color red . . .
Have a great day, and look forward to more peeks into your life! I love the changes and have followed you for a while. Keep it real. Take care. Mmmm. Old metal. I've been drawn to it more and more,too. oh i just LOVE it all....funny that I'm drafting a post now on my style (coming in next day or two) and I'm been leaning a little away from the rust (gasp! I know!) I think my syle is a bit more prairie at the moment. I wish you could come shop here for your industrial goodies! I love the industrial look too. I have brought in my father in laws old drafting tools and boxes. when I am out I tend to be drawn to the rusty/crusty stuff. but it goes well with my wicker! I love the direction of your blog...you keep going where your heart leads you. I just started my own blog so I will see where it goes as well. Yep, you've definitely got the industrial bug - girl, just wait till you see the treasue I found this week! Metal, wood, vintage, casters - I'll send you a sneak peak before I put it at the mall! I love the industrial look that you like. My sofa table fits right in with what you like, doesn't it? I think it's great to throw in some personal. I know that's not for everybody, but it just makes people seem more real and more approachable. Change is scary, but is also exciting - so let's go for the ride :-) I haven't figured out my style yet, as though we have just *one* style ... that's like only having one type of outfit to wear - so go with what works for you, and I know you'll continue to inspire! As far as the high schooler goes - I have one son who just graduated from high school and is off to college 3 hours away (TAMU CC). There is a huge empty space without him here ... so the only advice I have right now is to just go with the flow and enjoy your son as much as possible (not much advice, lol).